Aubrites belong to a group of meteorites called achondrites. This group of meteorites is different from chondrites in that they don’t contain chondrules, the silica-rich sphere like inclusions for which chondrites are known. Aubrites originated from asteroids and have a brecciated texture. This fragmented texture is the product of a violent collision between the aubrites parent asteroid and another asteroid. Mineralogically, aubrites are very similar to enstatite chondrites. 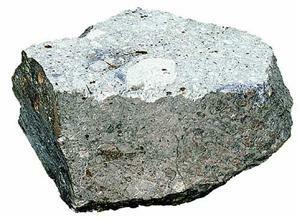 They are composed primarily of the magnesium rich pyroxene, enstatite. The big difference is that aubrites come from asteroids that heated to the point that they experienced melting and underwent some form of chemical change. In the geological sciences this is called differentiation. Another defining characteristic is the addition of the mineral oldhamite (1). This calcium sulfide, for reasons I’m not sure of, doesn’t form naturally in terrestrial rocks. This quality makes it a useful mineral in determining the celestial origin of aubrites. Chondrite- basically the sedimentary rock of the solar system. It’s an aggregate of the left over material from the formation of the solar system. Chondrule- Kind of the vagabonds of the proto solar system. They started off as molten spheres of either pyroxene, olivine or another silicate mineral that glommed onto the nearest asteroid, cooled and became the round features so prominent in ordinary chondrites. If you have further questions (or even corrections/critiques) post it in the comments and I’ll do my best to address it. So basically, what separates the three classes is the iron and iron oxide content. As one goes up the other goes down. Those round blobs in this image are the chondrules. In a later post I’ll give more information about this particular chondrite. Carbonaceous chondrites are the rarest of all the meteorite specimens. 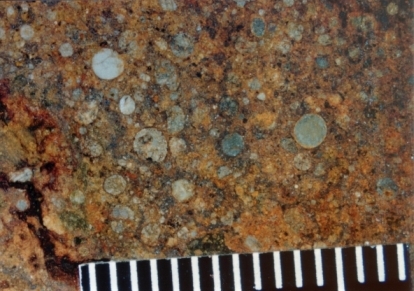 Like most meteorites, there are composed of a matrix and chondrules. The matrix is basically the body of the meteorite. In the case of the carbonaceous chondrite, it’s composed of soft minerals very similar to serpentine or montmorillonite (John A. Wood, The Solar System, 1979). Due to it’s composition, very few of these meteorites survive the entry into the earth’s atmosphere. Those that do face further weathering damage at the surface of the earth. The chondrules are the rounded minerals that are studded into the matrix. They are mostly composed of olivine and orthopyroxene and are generally rounded in shape (like the picture shows). However, not all CC’s have chondrules. Some have these irregular inclusions that are composed of uncommon minerals such as spinel and grossular. These minerals have been enriched in “calcium, magnesium, aluminium and titanium relative to silicon” (Wood, 1979).